Darren Naish: Tetrapod Zoology: Hunting Green lizards in Dorset: new aliens or old natives? Hunting Green lizards in Dorset: new aliens or old natives? If you like amphibians and reptiles (or, if you want to be as zoologically specific as possible: lissamphibians and non-avian reptiles), Britain is a pretty crappy place to live, with only a handful of natives. But strange things are happening: the diversity of our herpetofauna is being boosted by newly-appearing aliens, and some of our ‘long-established aliens’ are turning out to be genuine natives. Yesterday I spent the better part of the day in the field looking for lizards, and of the three species I saw, two are not natives. Probably. The trip (organized by the Southampton Natural History Society) was to Southbourne and Boscombe Cliffs, Dorset, and the main purpose was to see Western green lizards Lacerta bilineata*. This is a large lacertid - c. 130 mm snout-to-vent, and c. 300 mm in total length - that inhabits much of continental Europe except for the north-east: it’s also devoid from much of Spain and Portugal where it’s replaced by its close relatives the Ocellelated lizard L. lepida and Schreiber’s green lizard L. schreiberi. Vivid green and decorated with fine dark stippling, and with a yellowish throat that turns blue in breeding males, it’s an impressive looking, distinctive animal. It prefers to live in sunny places where there is bushy vegetation, and it even climbs quite high in bushes and shrubs to forage or bask (Arnold et al. 1992). * This species was until recently included in L. viridis but a 1997 revision separated L. bilineata and L. viridis as separate species (Amann et al. 1997). This complicates things, as it means that pre-1997 authors are not referring to our modern concept of L. viridis when they use this name. Indeed, much of the text you're about to read may be inaccurate as a result of this. While we know (from fossils) that green lizards formerly inhabited Britain, they don’t appear to be native to our islands today, with the exception of Jersey where they inhabit south-facing coastal heaths and dunes. They also occur on neighbouring Guernsey, but here they’ve apparently been introduced from Jersey (Beebee & Griffiths 2000). 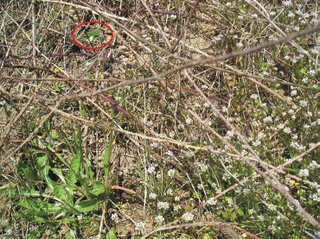 It follows, then, that the announced discovery of a green lizard colony on the well-vegetated Dorset cliffs of Bournemouth in August 2003 came as quite a surprise. These were the lizards we had gone to see: we got to within very close range of a lone male who was sunning himself among some bramble, and he’s the animal featured in the photos above (the top photo is a closeup, and the lower one shows the original field of view as seen by my camera. A red circle is drawn around the lizard). They’re not the only lizards here: there are also Viviparous or Common lizards Zootoca vivipara* and Wall lizards Podarcis muralis (both of which we saw too by the way. Damn we’re good). The former is definitely a native, while the latter is almost certainly not. What are these aliens doing here, and are they aliens or not? * This species is more usually known as Lacerta vivipara but, because Lacerta is otherwise paraphyletic, Mayer & Bischoff (1996) have argued that it warrants generic distinction. Green lizards are so pretty and charismatic that it comes as no surprise to learn that there have been numerous attempts to introduce them to Britain. Lever (1977) discussed introduction attempts that took place in Wales, Ireland, and Devon, the Isle of Wight, Surrey and Gloucestershire in England, with the earliest taking place in 1872. Some of these introduction attempts involved literally hundreds of animals, and must have been expensive undertakings. Numerous other releases are also known to have occurred, but, because there has never been any good indication of breeding occurring, Beebee & Griffiths (2000) noted that ‘on current evidence the species is not established in this country’ (p. 208). Even so, lizards introduced to St Lawrence on the Isle of Wight in 1899 were apparently still there in 1936, so some introduced colonies have persisted for quite a while. But there are also quite a few historical accounts that document Green lizards in places where, so far as we know, deliberate releases haven’t occurred. As early as 1769, Gilbert White wrote of seeing ‘Guernsey’ lizards. 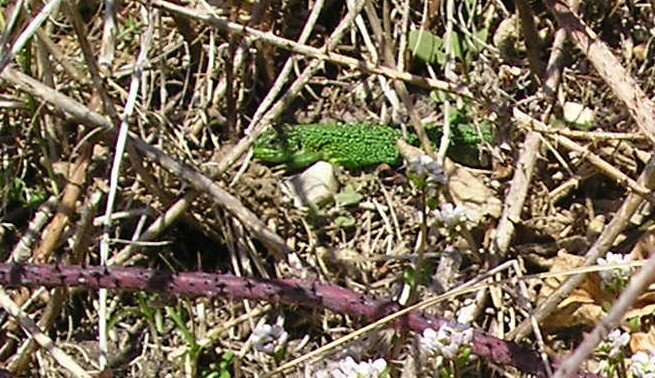 It is generally thought that he had misidentified the definitely native Sand lizard L. agilis however (this is a stocky, short-limbed species which, although often green, is altogether easy to distinguish from L. bilineata, and L. viridis and related species. It occurs as a native in Surrey, Dorset and Merseyside). Elsewhere, however, supposed green lizards were reported during the 1860s and 70s at Sidmouth and elsewhere in Devon, and during the 1900s in Dorset. One of the Devon records was made by a Mr John Wolley from Guernsey. He was apparently quite confident that the lizards he saw in Devon were exactly the same as the green lizards of Guernsey. 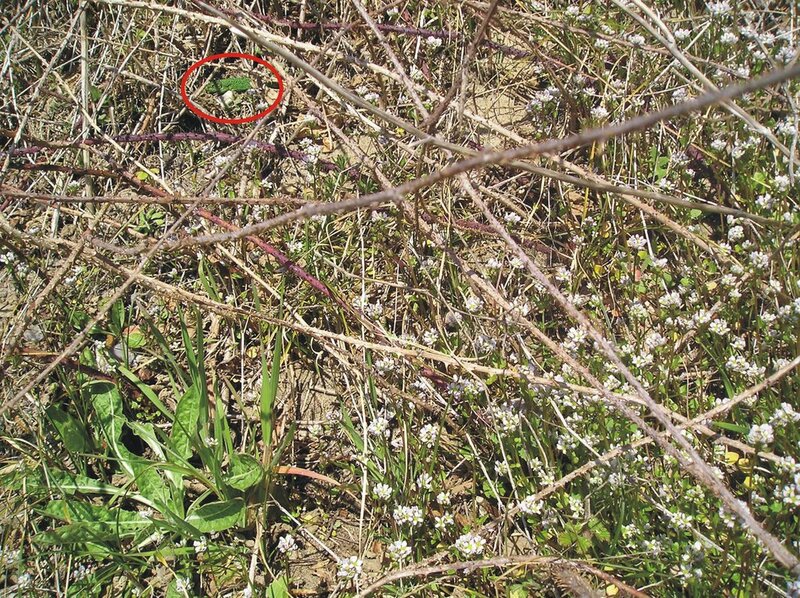 All of these reports were later dismissed as further misidentifications of Sand lizards, and while this might have been the case for some of the accounts, in others it appears unlikely, simply because the lizards described don’t match this species. In some of the Dorset records it is noted that the lizards were nearly 300 mm long, for example, which is way too big for L. agilis. On the basis of these historical records, Jon Downes (1994) proposed that viable feral colonies of green lizards existed in Devon and Dorset, and that they were probably introduced from either France or the Channel Islands. He became disappointed that his idea was ‘ignored by the zoological establishment’ and that ‘two famous zoologists (who shall remain nameless) told us that the theory was arrant nonsense. The paper was returned with a brusque letter from several zoological magazines and after a while we just gave up’ (Downes 2003, p. 13). Given that, as noted above, relatively long-lived feral colonies had been reported earlier from the Isle of Wight, however, it would seem likely that Jon was right. The presence of what appears to be a viable, breeding colony, this time at Bournemouth, led Jon (Downes 2003) to write an article titled ‘Told u so’ [sic]. However, because there’s no evidence that the Bournemouth colony is anything to do with the historical Devon and Dorset records discussed by Jon, it’s not entirely satisfactory to claim that his contention has been vindicated. Then again, the fact that the Bournemouth colony is apparently viable and spreading (breeding is thought to have occurred) suggests that other colonies in southern England may well have been capable of this too. The Bournemouth colony was discovered by herpetologist Chris Gleed-Owen of the Herpetological Conservation Trust when he was on his way to work one day, and the colony is located just a few hundred metres away from Gleed-Owen’s office (Gleed-Owen 2004). Why are the lizards there? Gleed-Owen has suggested that they are dumped pets that have since bred. Could they have been introduced accidentally from the Channel Islands, or the continent, as Jon suggested for the other possible colonies? To answer this you’d need to know what sort of imports Bournemouth receives from abroad, and I haven’t bothered to check that out. Finally, could they be late-surviving, hitherto-overlooked natives? This possibility has been inspired by the recent discovery that the (now extinct) British Pool frogs Rana lessonae of Norfolk and Cambridgeshire were almost certainly natives, and not continental introductions as usually thought. It’s also now being suggested that the European tree frog Hyla arborea colonies of the New Forest are also natives. Gleed-Owen regards the possibility of native status for the Bournemouth lizards as ‘unlikely, but not impossible’. I have to say that I think it’s unlikely for two reasons: (1) the location is well known to naturalists and is regularly well explored. If the lizards occurred there long prior to 2003, it’s difficult to believe that they would have been overlooked for so long. (2) All of Britain’s native amphibians and reptiles have European ranges that extend far to the north-east, usually incorporating Scandinavia. They are therefore relatively cold-tolerant, and this explains why they were able to colonise post-glacial Pleistocene Britain before the English Channel severed the continental connection about 9000 years ago. Conversely, green lizards are not animals of the north-east, which suggests that they wouldn’t have been able to colonise post-glacial Britain during that brief critical phase, as our definite natives did. But the exciting possibility that they are natives can’t be totally dismissed, and should be tested further. Given that I’ve now posted on British big cats and introduced eagle owls, as well as green lizards, I will admit that I’m very interested in the alien species we have here, and the implications they have for ecology and diversity. Most people know that we already have, or have had, a lot of bizarre alien species in our islands (including bears, binturongs, wallabies, coypu, Edible and Garden dormouse, Midwife toads, American bullfrog, Ring-necked parakeets and so many others), but given the climatic changes that are occurring, it is likely that our fauna will change dramatically in future decades as old natives find life increasing difficult, and as new aliens find survival here easier. Amann, T., Rykena, S., Joger, U., Nettmann, H. K. & Veith, M. 1997. Zur artlichen Trennung von Lacerta bilineata Daudin, 1802 und L. viridis (Laurenti, 1768). Salamandra 33, 255-268. Downes, J. 1994. Green lizards in Devon and Dorset? Animals & Men 2, 22-23. - . 2003. Told u so! Animals & Men 32, 12-13. Lever, C. 1977. The Naturalized Animals of the British Isles. Hutchinson &amp; Co, London. Mayer, W. & Bischoff, W. 1996. Beitrafe zur taxonomischen Revision der Gattung Lacerta (Reptilia: Lacertidae). 1. Zootoca, Omanasaura, Timon und Tiera als eigenstandige Gattungen. Salamandra 32, 163-170. The local council at Boscombe a recently cleared some gorse and stunted oak from the cliff tops. As a result I was able to see several young green lizards from their normally concealed areas. Unbfortunatly they will be at greater risk than usual. Phred - Bournemouth Natural Science Society. Hi there, I am currently collating all available information concerning Wall lizard colonies in the UK. You can check progress to date at www.surrey-arg.org.uk and hit the 'wall lizards' button. I am passionate about finding any survivors of the Farnham Castle colony, and if you have any details for Keith (above message) or anybody reading this knows of the EXACT location of this colony from personal experience, please let me know! (via web site). Thanks for your comment Steve. I am soon to blog about the Hampshire tree frogs (not here, but at my new blog site) and will be linking back to this green lizard article; I also have an article on the green lizards in press for the annual report of the Southampton Natural History Society. I'll ask around about the Farnham Castle lizards: I'm giving a talk for the Bournemouth Natural History Society in a few weeks so will ask people there as well. Steve: it probably isn't of any use, but go here to see someone mentioning possible presence of the Farnham Castle colony as recently as 2003. I still have a few people to ask about this and will post any further news on this page. Let us know if you have any success! Incidentally, the article about the New Forest tree frogs is now available: please go here. I am afraid that I have never really understood the papers of J.Downes on the Green Lizard. The Green Lizard, Lacerta viridis, as it was then known was very popular amongst vivarium keepers in the 1800’s, people at that time were also notorious for trying to introduce “exotic “animals. This would , to me , be a much more simple explanation for sightings of Green Lizards rather than escapes from cargo or relict populations. The Boscombe colony is a fairly recent introduction and is still showing an increase in numbers and spread. This is also the case with the colonies of Wall Lizard that have popped up in Dorset, established by a few misguided but successful breeders of these lizards who have been able to release large numbers over several years. Thank you for your comment David. As expressed in the article here, and elsewhere, I don't think that the case for native status is good, and it does appear most likely that the lizards were introduced. However, I'm not sure I agree with you that this is a given: you state it as if it's a fact. I wonder if you therefore have access to undisclosed information.. please do tell. Best wishes. PS - to those interested, I've been asking around about the Farnham Castle lizards, and as yet there's nothing useful to report. I was walking along the cliff top at Cliff Road, Canford Cliffs, Poole, Dorset today, 21/05/08 and saw a green lizard running along on the wooden beam at the base of the chainlink fence. Nice photo, but note that it's not of a Green lizard, but of a Wall lizard Podarcis muralis. This is another non-native present at various localities in Dorset. Do you get great crested newts in central scotland ? 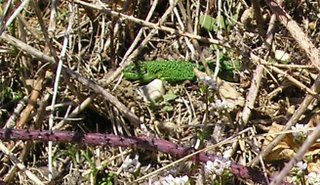 This weekend I saw the brightest green lizard on heath land to the west of Poole, not like any of the sand lizard pictures I have seen, certainly no brown spots. Perhaps they are moving west. I worry our heath land is far too fragile to put up with the amount of horses and bikes and saw some areas where the habitat has been totally eroded away to the clay sub soil. Hi - We have just found what we realised was a green lizard (half its tail missing) in our hall in Dorchester. Perhaps our cat brought it in- it ran out to the front garden, which has shingle and shrub cover. Both of us were pretty surprised - does anyone know of green lizards in dorchester? I have recently returned from Ardeche region, France and found a green lizard, (L. Viridis or L. Bilineata) probably the latter from what I gather, in my dry bag. I canoe out there. As I wasn't sure whether the are possible to release here, I have set up a vivarium to house it (him). Cost me quite a bit but am interested in reptiles. It has lost its tail due to being attacked by a cat on our campsite there. Must have seeked refuge in my bag!! I intend to keep it atleast until I find some way of releasing it confidently. I can let you know how the project goes. I have been pointed to your website by someone on Flickr. We were in Boscombe the other day and spotted a wall lizard. I had not heard about this colony beofre I went there, so was suprised to see it. If you are interested in using my photo for your blog thenI am happy for you to do so.